There's never been a better time to get into Android apps, as the Google Play store has exploded in recent years, with a proliferation of titles that can cater to your every need. The problem is: there are just too many of them, even with Editors' Choice, Featured and Best Selling, Top Paid and Top Free categories there to help. You can filter, see Google's lists or read the reviews - but the easiest (and best) way to find top quality apps is to have someone else do the searching for you. That's where we come in. Like you, we want the best apps for our Android phones. The apps that are going to revolutionize functionality or, at the very least, offer something so great that it becomes one of the must-have apps that has to be downloaded whenever you get a new handset. The following apps will be constantly updated and are a mixture of paid and free ones that have been chosen by our Android experts. So, even if you do dip into actual cash for one of these apps, you can be safe in the knowledge it's a worthwhile purchase. We’ve also sorted them into categories, so you can find what you’re looking for more easily. Click through to the following pages for those or check out the best Android apps of the week below. These are the two apps that we've chosen to highlight each week. They're usually new apps or apps that have recently received a major update, but occasionally hidden gems and other essentials will also be highlighted. If there are any apps that you pretty much live inside then App Tiles could be for you, as it makes accessing them even quicker and easier. It does this by letting you add a shortcut to them on your notifications screen, just like you probably have shortcuts to various settings up there now. App Tiles lets you assign up to six such shortcuts for any apps on your phone, so rather than returning to the home screen to launch one of them you can do so with a swipe and a tap. This won’t always be faster, especially if you’re already on the relevant home screen, but it gives you one more way to get into them and is sure to save time on some occasions. We wouldn’t say this is essential for everyone, but it works perfectly in our tests and it’s totally free, so it’s well worth checking out if the idea appeals. Opera Browser is nothing new, but it has had an update making it better than ever, with a free VPN built in. This optional feature gives you greater privacy and security while browsing and is something you’d usually need a separate app and often a paid subscription for, so it’s a great addition. Beyond that, this is mostly the same fast, slick browser it’s always been. It includes things like an ad blocker and a data saving mode, plus night and private modes and a personalized news feed, and it comes from a trusted name that’s been making browsers for years. It can be tempting just to stick with Chrome, but if you’ve never tried Opera Browser there’s never been a better time to. Our favorite Android apps for shooting, sorting and editing photos and videos. Photo Watermark does exactly what the name suggests – it lets you add watermarks to photos – but the types of watermarks you can add are quite varied. Not only can you add custom text as a watermark (including changing the font, size and color), you can also use your signature (or any other hand-written text) as a watermark by writing on the screen. You can also apply stickers, a timestamp, a location, a mosaic effect, or ‘graffiti’ (which basically just lets you go wild on your images with a digital paintbrush). Whether you want to protect your photo or just log when and where it was taken, there should be a tool here to suit. Photo Watermark is free, but it’s quite heavy on adverts. For $0.99/£0.89 per month you can get rid of them, but unless you’re adding watermarks to a ton of images it’s probably not worth it. StoryZ Photo Motion & Cinemagraph is a photo editing app in two parts. The first of these is ‘Ripple’, a mode which lets you add motion to a static image by drawing the area and direction that you want the motion to happen. This can be an effective way to make it look like water or smoke is moving for example, or simply to add a slightly trippy effect to things that you might expect to be static. The ‘Motion’ mode, which lets you blend a video with a photo, leaves you with an ‘image’ that’s partially static and partially in motion. In both cases it can be hard to make the effect look convincing, but it’s doable, as evidenced by all the impressive public submissions shared on the app. StoryZ also holds contests with specific themes, such as ‘stairs’ or ‘sand’, which you can enter by submitting a relevant creation. The best ones will be featured on the home page and competition page of the app. You can use StoryZ for free, but if you find that you have more of a talent for it than we do then there’s also StoryZ Premium, which for a monthly subscription removes adverts and watermarks, increases the allowable length of videos in Motion mode, improves the toolset in Ripple mode and lets you save and share in high resolution. KineMaster is probably one of the most powerful video editors on Android, but it’s also intuitive enough that anyone could enjoy using it. The app lets you add audio and visual filters to footage, add text, stickers and other overlays, alter and trim videos frame-by-frame, adjust the speed, add transition effects and a whole lot more. You can also record videos straight from the KineMaster app. It can feel a little cramped on a phone screen, but otherwise everything works well. You can use KineMaster for free, but all your videos will have a KineMaster watermark and you can’t use them commercially. To remove the watermarks, allow commercial use and unlock additional assets (such as effects and overlays) you have to pay a subscription, but at £2.91 (roughly $3.70) per month it remains affordable. 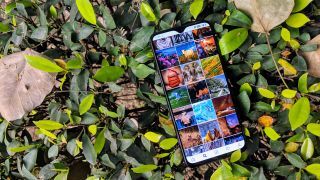 A truly great camera app arguably needs to both avoid clutter and be packed full of manual controls, so you can capture an image exactly as you want it, but that’s a tough balance to strike, and few manage. Moment – Pro Cameraarguably does though. It gives you full manual control, including RAW shooting, shutter speed, ISO, white balance, exposure compensation and focus. There’s also tap to focus, a timer, a grid and several different lenses. It’s an impressive toolkit, with the app focusing more on powerful utilities than gimmicky filters, but it all has a very clean, minimalist look. And it’s designed with ease of use in mind. You can double tap any setting to return it to auto or double tap the viewfinder to turn everything back to auto and all the controls are within easy reach. The main downside of Moment is that it can’t currently shoot videos, but for photos there’s a good chance you’ll want to replace your current camera app with this, and video is apparently in the works. IGTV is a new app from Instagram that’s focused on long-form video content. Rather than the one-minute videos of old, you can now make and watch videos up to an hour in length. Videos are in full-screen portrait format, which is unusual for longer content, but makes it easy to hold your phone while watching. If you already have an Instagram account you can simply sign in to instantly see content from people and brands that you already follow. You can also like and comment on videos, view popular ones and browse and search for content beyond the stuff that the app already highlights to you. Technically, you don’t need the IGTV app to access all this stuff, as it’s also been added to the main Instagram app, but if long-form video content is the main thing you’re interested in rather than photos or shorter videos, then the IGTV app is the best way to get it. Your phone might have a powerful camera, but chances are it doesn’t come with much in the way of photo editing tools. Fortunately, PhotoDirector can fill in the gaps. This app lets you adjust the tone, saturation, white balance and colors of photos you’ve previously taken, as well as adding filters and effects, which you can adjust the strength of and apply to all or just part of an image. You can also add text, stickers, frames, change the perspective, mirror the image, cut sections and a whole lot more. There are lots of tools, but PhotoDirector is easy to navigate and you can always undo your changes, so you’re safe to experiment. And that’s just the editing part of the app. There’s also a built-in camera, which lets you shoot new photos with various effects and see live through the viewfinder how they will affect the image. PhotoDirector is largely free, but if you want to direct to your best there’s a premium version that costs £2.59 (around US$3.70) per month, with discounts if you commit for three months or a year. This unlocks additional tools, boosts the output quality and removes adverts. “The best effects are the ones no one knows you added.” So says the intro video to Lens Distortions, and it has a point. Rather than flashy, gimmicky effects and photo filters, Lens Distortions has a selection of natural, true to life ones that look like they could have been captured by the camera itself. These include sunlight, rain, snow and fog effects, so tend to be most suited to outdoor shots, but they look convincing and there’s a selection of different looks in each category. Once you’ve applied a filter you can tweak it by adjusting the brightness, saturation, contrast and more, and add extra layers so you can apply more than one filter at a time. The interface is slick and intuitive, and your edited photos can be saved to your phone or shared with various social media and cloud storage apps. You get 40 filters for free at time of writing, but for a $0.99/£0.99 monthly subscription you can unlock additional filter packs and 215 premium filters. As a one-off purchase it would have been easy to recommend, but as a subscription it’s probably only worth it if you find yourself using Lens Distortions a lot. Either way though the free version is well worth a download. If you want an all-in-one photo editor for Android then LightX Photo Editor is a good choice, not least because most of the features are free. You can merge photos, add effects and filters, selectively apply colors to regions of an image, adjust the color balance, smooth and sharpen images, crop them, rotate them, draw on them, add frames and stickers, add text, create collages and a whole lot more. That’s all handled through an intuitive interface; bring up the main menu with a tap, select the category of edits you want to make (filters or frames, for example) and you’ll be taken to a menu with all the relevant options. Most of it is fairly self-explanatory, but there are also tutorial videos for if you get stuck, and for a one-off $3.69/£3.49 IAP you can get rid of adverts, unlock additional stickers and frames, and add the ability to save images in PNG format. 8Bit Photo Lab is a photo filter app that takes you back to simpler times. Times when games didn’t have near-photo-realistic graphics and Android was just a glint in Andy Rubin’s eye. Simply snap or import a picture and pick a color palette from over 50 options, such as Game Boy or Commodore 64. Your photo will then instantly transform into something you might have seen on a screen from that era. But that’s just the beginning, you can also add effects such as noise and checkerboard patterns, change the resolution and aspect ratio, tweak the contrast, saturation and brightness, and add 8-bit stickers, such as a mouse cursor, or little characters that look like they’ve come straight out of a game from the late 80s. Essentially, 8Bit Photo Lab is like Prisma for anyone who prefers old-school video games to modern art, but it’s a well thought-through app. Once you’ve tweaked an image to perfection you can add exactly the same filter to other photos with a swipe, for example, and while you get plenty for free, you can unlock lots of extra options with an IAP, including the ability to turn your creations into animated wallpapers. No matter how good your smartphone camera is your images can still be ruined by unwanted additions, be it people in the background, a trash can in your landscape or blemishes on your own face. TouchRetouch is here to help, by removing anything that you don’t want in your shot. You can get rid of unwanted objects by highlighting or circling them, and simply tap a blemish to remove it. There are additional tools to clone or mirror parts of the image, and video tutorials to help you get more out of the app – though most of the features are fairly self-explanatory. Results aren’t always perfect, with the app trying but not always entirely succeeding to hide the seams when you cut someone out, but you don’t have to save any changes you’re unhappy with and it generally does a surprisingly good job, all with only a few taps from you. You can also flip, rotate, mirror and crop images, but SKRWT isn't interested so much in modifying photos in unnatural ways, as in making them look exactly as you envisioned when you took them. It's a professional tool, but it's easy to use and you can always undo your changes if you don't like them.